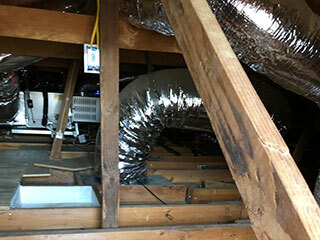 Most people don't consider their crawl spaces all that often, but they should! Your home's pipes, cables, and even insulation are all located there, and they can be in trouble if it isn't properly taken care of. If the vapor barrier is broken from a storm or pests or the entrances aren't properly sealed, moisture may be able to get in and degrade the insulation, as well as cause mold to form. It can also cause pipes to rust, wearing them down to the point they may burst and cause an even larger problem with water. The wood structures may start to rot from absorbing the water, and might eventually break and cause a cave in. This can affect the flooring of your home and make it uneven, and much worse! One step you can take to check for signs of a problem is to look into the crawl space itself with a flashlight. If you see standing water, discoloration or rusting of the pipes, or sagging wood, these are all solid indications that there's an issue that needs to be taken care of. There are signals that can be noted inside your home as well, such as a bad smell, which can mean mold is taking over. If you or someone else in the house has allergies or breathing troubles like asthma and the symptoms persist even indoors, this can also mean that harmful mold spores are reaching up into the household. Whatever the issue may be, our technicians will be able to handle it with their experience as well as using the best tools and materials in the area. This will ensure that the job is done right, and that it will last as well! We can easily repair damage to the vapor barrier, check the sealing on entrances to make sure moisture isn't getting in that way, and much more. Contact Attic Cleaning Los Angeles today, and we'll get right to work!